Foam Boards are a Economical Alternative. Business presentations to artwork reproduction, they are a cost-friendly way to reproduce your images. Whether you are using it for a single use or for a long term display, they are a great alternative. With proper care they can last for years, making them ideal for photographs or long term promotional displays. They are both lightweight and ridged, making them ideal for transport. Used in conjunction with other items you can reinforce your branding and message. 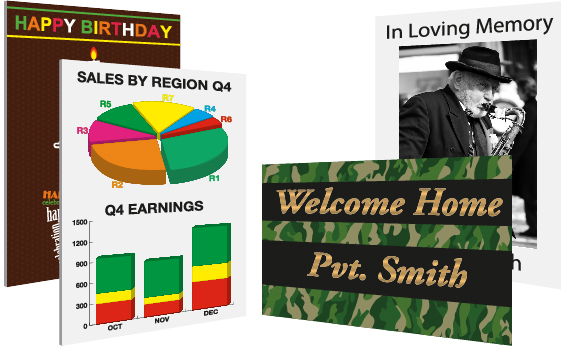 Common combinations include Banners and Flyers with complementary layouts.